Wooden Swords are most ideal for Practice and great for learning new skills and techniques while providing the safety of a practice replica. There are variety of practice swords and daggers. Practice swords made of quality wood to help in becoming master of the Ancient techniques of self defense. Made from Solid ard wood for sparing and improving martial art technique. Our experts make use of best and world class collection of Wooden Sword that are used in martial arts and gyms. Olympia wooden tiger head hook sword for training of wushu & kung fu. Packing, Forwarding & Sales Tax extra. 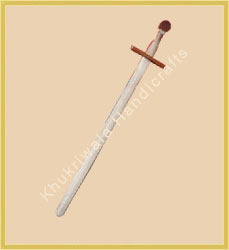 In order to retain our goodwill in this industry, we are providing a latest array of Wooden Sword .